Newgrange passage tomb in the Boyne Valley – County Meath, Ireland is the oldest, fully in-tact building in Ireland, and probably in western Europe. According to Mary Gibbons who offers excellent tours of Newgrange, the tomb dates back 5000 years, predating the pyramids of Egypt, Stonehenge and all the other tombs and prehistoric enclosed structures in Ireland and Britain. 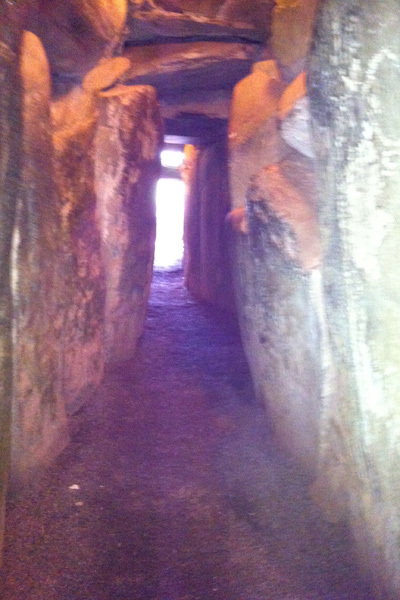 Newgrange was a center for spiritual ritual and has remained intact since the Stone Age. The inside is large with a center chamber large enough for 20 people to stand and three side chambers. It was here that the early people of the Boyne Valley placed cremated remains. From the outside, Newgrange looks like a large, flat, round building with a grass roof and stone sides. These outside cosmetics are new and not part of the original structure. But the tomb itself and the entrance has not been altered. The entrance is dominated by a mammoth-size boulder with intricate spiral and diamond shaped carvings. One had to cross over this stone to gain entry. Above the entrance to the tomb is a stone lintel which allows the passage of light into the tomb on the Winter Solstice (December 21) – the shortest day of the year. Newgrange was built according to a specific blueprint that allowed for the tomb to be illuminated by the sun on the day when sunlight shines for the shortest amount of time. The illumination lasts approximately 15 minutes. Then total blackness sets in again … until the next year. 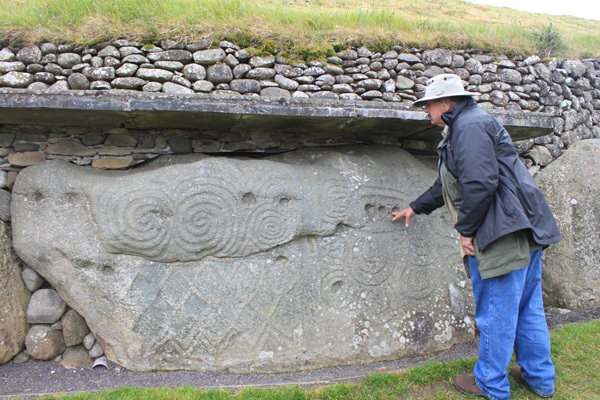 Ancient carvings of spiral designs were common in this age and region, but Newgrange has the rare “triple spiral” on both its entrance stone (shown below) and on the wall of the tomb. Who knows what the spirals meant? 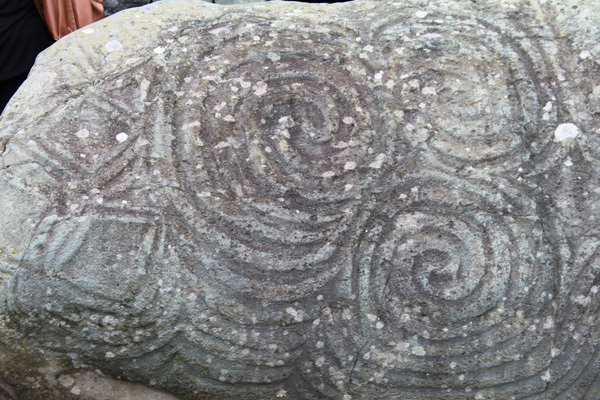 Spirals and diamonds appear on other stones at Newgrange, including one of the curbstones around the back. Many have guessed at what the spirals mean. The best definition I heard was the the spirals symbolize how time passes – rather than linear, time is circular, like the seasons. While we live in this time we could be passing closely by those who lived before us and will live after us. Time turns – rather than passes. Kayaking - How Difficult is it? Theadora, they have a lottery still and you can sign up as many times as you want in the Newgrange visitor center. It’s a long shot as thousands have cast their names. Also, if it’s cloudy on Dec 20-22, the sun is blocked and you don’t see a thing. What are the chances of it being cloudy in December in Ireland? Thanks for the comment. Always good hearing from you. So glad to see this, Mindy ~ we were in Ireland December 1988 (same time as the Lockerbie bombing when the Pan Am plane went down)… I’d had my name in for ages to the Irish Board of Public Works (or whatever that agency was called in those days!) to be on a list to be present in the passageway on the winter solstice. There used to be a lottery, too. But it never happened. Don’t know if this is still allowed. Thanks! Will share on fb.